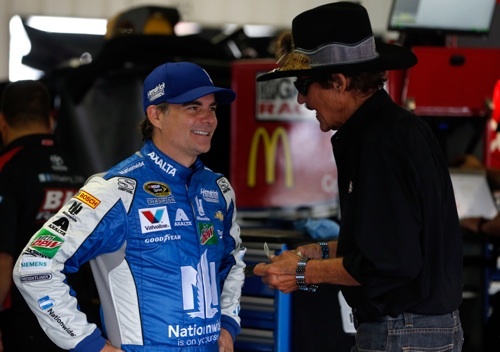 Jeff Gordon (left) with NASCAR Hall of Famer Richard Petty (photo courtesy of Getty Images for NASCAR). When the NASCAR Sprint Cup Series takes the green flag Sunday for the Cheez-It 355 at Watkins Glen (N.Y.) International, the second and final road-course race of the season, for the series, three drivers will be making milestone starts in their Cup careers. When Jeff Gordon retired from full-time Sprint Cup competition as a driver at the end of the 2015 season, he was just three races shy of the 800 mark. On Sunday, though, Gordon will make his third start as the fill-in driver for the sidelined Dale Earnhardt Jr. behind the wheel of the No. 88 Hendrick Motorsports Chevrolet. As a result, Sunday’s race will mark Cup start 800 for the four-time champion. Gordon’s Cup career began when NASCAR Hall of Famer Richard Petty’s ended in the 1992 season-finale at Atlanta Motor Speedway. Petty’s last was Gordon’s first, and Gordon was a fixture in every Cup race from then until the season-finale at Homestead-Miami Speedway last season. Gordon never missed a race between that first start in Atlanta through the end of the season at Homestead-Miami in 2015. All 799 races, to this point, came from behind the wheel of a Hendrick Motorsports Chevrolet, all in the No. 24, except for races this year in which he substituted for Earnhardt. Gordonhas four championships, coming in 1995, 1997, 1998 and 2001. He’s also third on the all-time wins list with 93 trips to victory lane, trailing only Petty and another Hall of Famer, David Pearson. As Gordon makes career start 800, Matt Kenseth will be making Cup start 600. Kenseth, driver of the No. 20 Joe Gibbs Racing Toyota, is the 2003 Cup champion. He has 38 wins to his credit, including two, so far, this season. Kenseth began his career as a substitute driver for Bill Elliott in 1998 and made a handful of starts in 1999 before going full-time Sprint (then-Winston) Cup racing for Roush Fenway Racing in 2000. He made the move to Joe Gibbs Racing in 2013. Meanwhile, Michael McDowell will make his 200th-career Sprint Cup start on Sunday, driving the No. 95 Circle Sport-Levine Family Racing Chevrolet. McDowell has competed in 17 of the 21 races, so far, making Sunday his 18th start of the season in the 22nd race of the year. He has one top-10 this year, a 10th-place showing at Daytona (Fla.) International Speedway last month. In all, he has three top-10s in his 199 race starts, so far.